Before you can optimize production, you need to understand where efficiencies can be gained in your plant. To do this, you need a clear view across entire lines and production processes. FactoryTalk® View Site Edition (SE) is a supervisory-level HMI software for monitoring and controlling distributed-server/multi-user applications. It provides a comprehensive and accurate picture of operations, meeting the demands of multiple stakeholders including engineering, maintenance, operations, and production Information Technology (IT). Bourbon producer increases production, delivers a more consistent product, improves operator productivity, decreases waste, and creates a safer work environment for its operators. Food manufacturer creates a common infrastructure for machine builders for first centralized data-collection system on a greenfield site. The computer hardware you choose to install and operate your FactoryTalk® View SE System should be adequately sized for the demands of each component, and meet the following system requirements. Typically, application servers such as FactoryTalk View SE Server, FactoryTalk Alarms and Events, and RSLinx® Enterprise will need to be sized with faster CPUs and more RAM than operator or engineering workstations. The greater the demand, the more powerful a system you need. You should also specify a hard drive with enough disk space to provide virtual memory that is at least twice the size of the physical RAM. Operator Workstation: Intel Core 2 Duo or greater FactoryTalk View SE Client or FactoryTalk View SE Station installed. Application Server (medium to large system): Quad core Intel Xeon family or greater FactoryTalk View SE Server, FactoryTalk View Studio Enterprise, FactoryTalk View Alarms & Events Tag Based Server or RSLinx Enterprise Data Server with FactoryTalk Alarms and Events enabled. *You can only use Windows Vista to either host stand-alone or distributed applications that run on a single computer, or run the FactoryTalk View SE Client or FactoryTalk View Studio software, which can connect to an application hosted on the same computer, or an application hosted on a remote computer. You cannot use Windows Vista to host HMI servers that other clients connect to. To host HMI servers, use another supported operating system instead. Operator Workstation with FactoryTalk View SE Client or FactoryTalk View SE Station installed. Engineering Workstation with FactoryTalk View Studio Enterprise, RSLinx Classic, RSLinx Enterprise or RSLogix 5000 installed. Application Server with FactoryTalk View SE Server, FactoryTalk View Studio Enterprise, FactoryTalk View Alarms & Events Tag Based Server or RSLinx Enterprise Data Server with FactoryTalk Alarms and Events enabled. Find all the information on installing and navigating through the FactoryTalk View SE software. The FactoryTalk View Site Edition Server stores HMI project components (for example, graphic displays) and serves these components to clients. The server may also contain a database of tags, perform alarm detection, and manage historical data. RSLinx for FactoryTalk View Site Edition and RSLinx® Enterprise are included with the FactoryTalk View Site Edition Server bundles. FactoryTalk View Site Edition Client is software for viewing and interacting with supervisory-level applications. FactoryTalk View Site Edition Client licenses are deployed as dedicated (when installed on the computer hosting the FactoryTalk View Site Edition Client) or floating licenses (when installed on the computer hosting the FactoryTalk Directory). FactoryTalk View Site Edition Station allows stand-alone (non-distributed) applications to run on a single computer. Note: Both RSLinx for FactoryTalk View and RSLinx Enterprise are included with FactoryTalk View Site Edition Station. 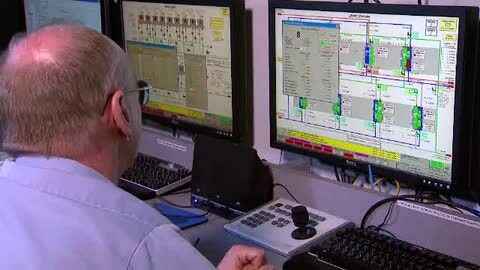 FactoryTalk View Studio is configuration software for developing and testing supervisory-level and machine-level Human-Machine Interface (HMI) applications. FactoryTalk View Studio can use dedicated or floating licenses. KEPServer Enterprise provides serial and Ethernet OPC servers that allow communication between many third-party industrial devices and RSView32, FactoryTalk View Site Edition, and FactoryTalk View Machine Edition. All drivers are supported by Rockwell Software.